Since we do not have an in-store showcase, we had to come up with a way for you to see exactly what you are buying before you buy it, and our build it yourself online showcase was just the answer. Go ahead and give it a spin, it can be a lot of fun! All you need to do is build your ring, necklace, earrings, or bracelet online. Then send us the details, and we’ll email you a price. Or if you prefer the face to face approach, with a little guidance, we will gladly go through it with you here in store. Example of our online store. Easy to shop and build your own engagement ring or jewelry. You’ll create your piece through our online showcase. Click here to get started with our online showcase! 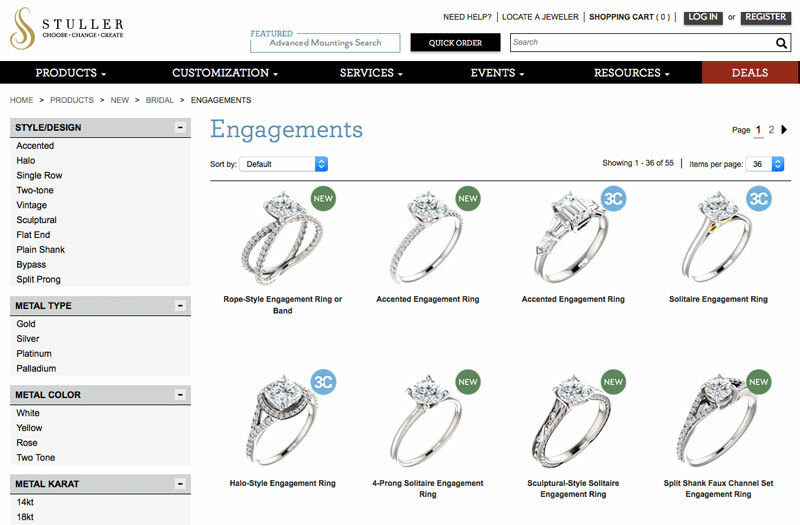 Select and configure your jewelry piece. Choose your metal, stones, and other options depending on the piece. Note that these estimates are based off of predetermined markups, and may not reflect the actual cost of the item. Please use the “Add to Quote” button to request a final quote. We should receive your email shortly. We’ll get back to you as soon as possible with a price quote for your piece. Alternatively, print it out and bring it in to Rose Jewelers. We can provide a quote on-site.